See Hymnary.org for the text and music of this magnificent hymn. 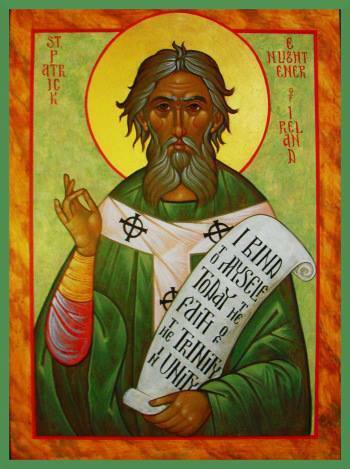 This entry was posted in Daily Office, Lent and tagged Christ the Lord, Lorica, Morning Prayer, St. Patrick, St. Patrick's Breastplate, Trinity on March 17, 2014 by Rodger Patience. I want to reflect not so much on the doctrine of the Trinity but on the method of Trinitarian faith. It took more than 400 years of sustained practice and reflection before the Christian church articulated the doctrine of the Trinity. The Apostles’ Creed is first mentioned by Ambrose around 390; the Nicene Creed came after the Council of Nicaea in 325 and was revised by the Council of Constantinople in 381; Augustine wrote On the Trinity in 415; and the Athanasian Creed dates to sometime after the Council of Chalcedon in 451. From the beginning Christians gathered to pray daily (just as they had been doing as observant Jews), celebrated the Lord’s Supper, and ministered to those around them, making disciples through the power of the Spirit. “No one has ever seen God,” writes the author of the Gospel of John. “It is God the only Son, who is close to the Father’s heart, who has made him known” (John 1:18). “There is one body and one Spirit, just as you were called to the one hope of your calling, one Lord, one faith, one baptism, one God and Father of all, who is above all and through all and in all” (Ephesians 4:4-6). 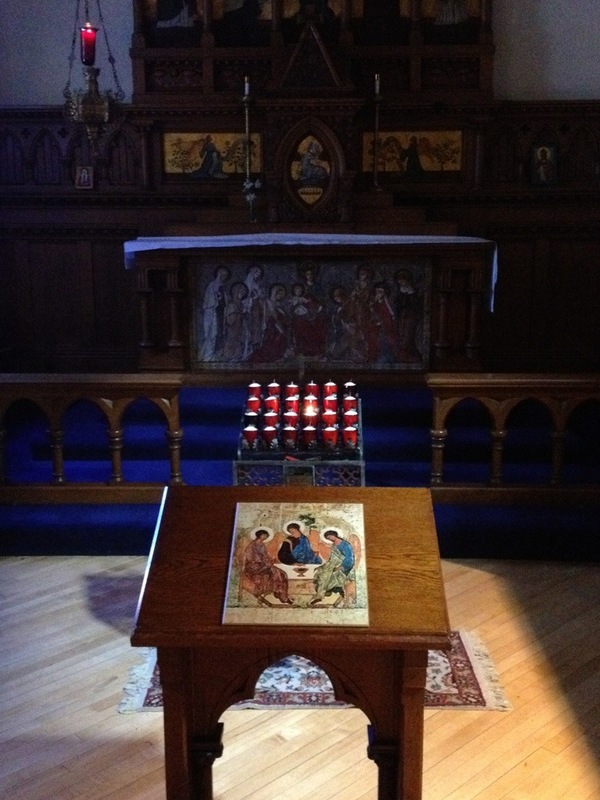 “Jesus is Lord” rings the cry of faith; “We are one in the Spirit” say the apostles to Jew and Greek, slave and free, male and female; “How good it is to sing praises to our God” we pray every morning and every evening, joining our voices to the Psalmist’s (Ps. 147:1). 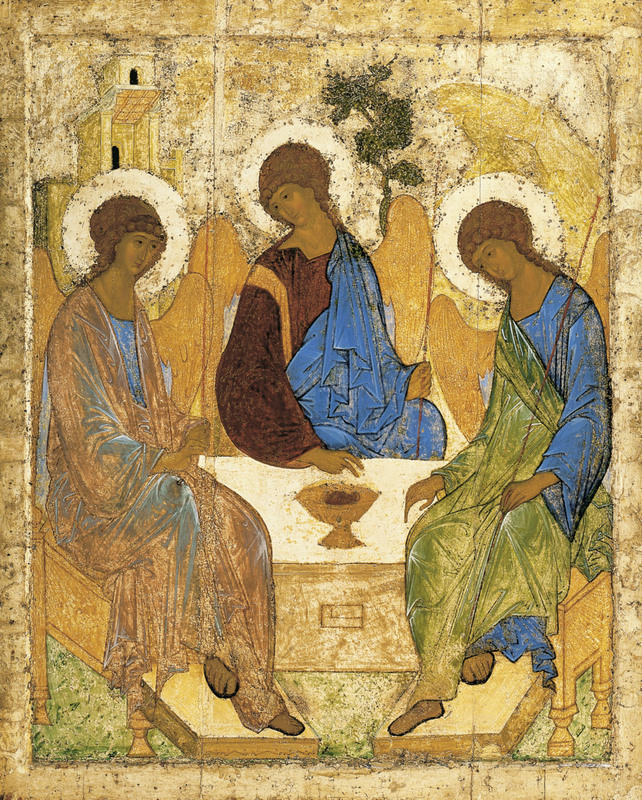 The doctrine of the Trinity is the attempt, however mathematical and philosophical it may be, to account for the lived experience of the Church, following the Lord Jesus in the power of God’s Spirit and in praise to the eternal Father — acknowledging the Trinity and worshiping the Unity. This entry was posted in Daily Office and tagged Ephesians, John, Morning Prayer, Sirach, Te Deum, Trinity on May 26, 2013 by Rodger Patience.